Are high rise (apartment) buildings in Kathmandy Valley earthquake proof? 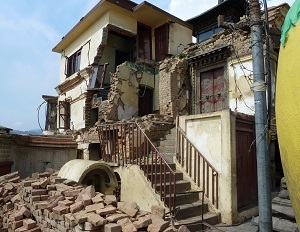 Are high rise (apartment) buildings in Kathmandu Valley earthquake proof? One of the questions after the 7.9 and 7.3 earthquakes of April/May 2015 is whether the high rise buildings that have been constructed in Kathmandu Valley are safe enough. The answer is that some of them certainly are not and from most of them it is uncertain whether they will be strong enough to withstand a 8.5 to 9.0 earthquake. But given the fact that many high rise buildings already suffered a lot of damage after the 7.9 earthquake some 80 kilometers outside Kathmandu most high rise buildings probably won’t be strong enough to withstand a much more powerful earthquake. It is questionable whether building guidelines have been followed correctly. Herewith a video of a modern building of only 7 stories which was not strong enough to withstand the 7.9 earthquake of April 25. And a video of the state of several apartment buildings after the 2015 earthquakes. There are some voices saying it might be wise to limit the height of building to only a couple of stories. Maybe a limitation of three floors is a little bit too strict, but for sure smaller buildings will be safer for the inhabitants of the building itself and its surroundings. Such buildings will be less likely to collapse during a very powerful and/or long-lasting earthquake and if they do, the chances are higher that all people get out before it collapses and the amount of rubble will be smaller and less likely to bury other buildings in the neighborhood. In the mean time we advice (future) residents of high rise buildings to thoroughly check whether a building is considered to be safe enough or not. In case of any doubt, don’t buy or rent an apartment of office spaces in such a building. Besides that it is better to avoid older unsafe buildings especially when they are 4 to 10 stories high (f.e. in the Old Town, Gongabu, Baleju and similar areas full of unsafe buildings). Owners of high rise buildings might have their buildings checked by foreign (f.e. Japanese) and unbribable engineers or the government should create other reliable ways of certificating safe high rise buildings. It is most likely that many of the current building will fail to pass. Apparently the Nepali Government is not sure about their building codes as it has imposed a 2 month ban on house design approval and is working on stricter building codes and better monitoring / enforcement of those codes. It is very sad the Nepali Government and many Nepali people "needed" such an earthquake before revising the building codes and construction manners as it was known for many years that a lot of buildings would not be able to sustain an huge earthquake. - experts say the disaster should serve as a wake-up call about the dangers of high-rise buildings in a city with a history of earthquakes. - “No dynamic soil test has been conducted in Kathmandu to measure how the soil will react to seismic waves,” said Deepak Chamlagain, a geology professor at Kathmandu’s Tribhuvan University." - Works underway at Park View Horizon Apartments in Basundhara, Kathmandu. The complex was severely damaged by the earthquake last year.